“Poland is a rather homogenous country and has only been a free society the last 25 years. The interaction of cultures is not popular among all groups of society. Most of the prejudice – like –anti-Semitism is invented and not grounded in real historical events, but in distortions,” Joanna explains. “This campaign gives people an idea of the scope of the problem,” Joanna says. 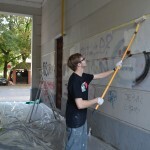 One specific incident six months ago of hateful graffiti close to the Polska Association’s offices illustrated how painting over hateful messages has a preventive effect. The office is located close to a Nigerian restaurant and the area has a large African community. When the restaurant was vandalised with racist graffiti, members of the local community – both Poles and people with minority backgrounds – were mobilised. “Through social media we were able to gather around 50 people and paint over the graffiti 24 hours later. Since then, it has never come back,” Joanna says.